Hot on the heels of the fantastic Orion Studio (reviewed here), Orion has introduced another new interface, the Orion32 HD. This 64-channel, premium audio interface, is based on the Orion32 but in addition to upgraded audio specs, ads HDX connectivity for direct connectivity to Pro Tools HD systems. It also features USB 3.0, MADI, ADAT, and S/PDIF, so odds are you’ve got a way to incorporate this interface into your studio, with our without Pro Tools HD at the center of it. The Orion32 HD has 32-in/32-out analog via DB25, and features the same fantastic clocking, low latency operation, and hardware-based vintage effects as siblings in the product family. 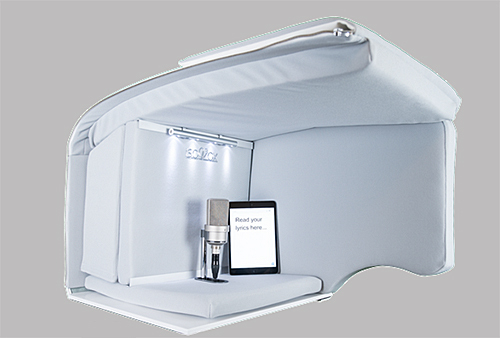 The Aston Halo Shadow provides another solution for reflection filtering in a portable vocal booth design. In a shape resembling a clam shell, it enables the vocalist to enjoy the surroundings of the room without interference from unwanted reflections due to the hemispherical filtering. With its proprietary easy-mount hardware, it attaches directly to a microphone stand. Thomas Barefoot has done it again with a new design to complement the already legendary Micro Main speakers. 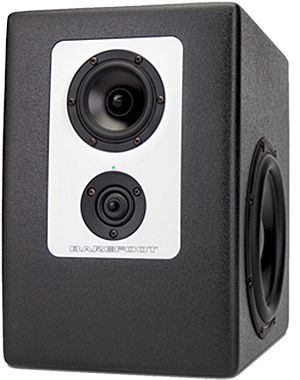 Only this time, Barefoot has targeted smaller studios and home recording enthusiasts with the Footprint01 three-way, nearfield monitor. Inspired by the Micro Main, this new speaker is priced at around $3,500 for the pair, but considering that the next step up is the Mini Main (which retails close to $6,000/pair), this set puts Barefoot monitor speakers within the realm of possibility for many project studios. The Footprint01 has most of the same features of its larger family members like Meme speaker voice emulation (so you can audition material on virtual NS 10s), a huge frequency response of 36Hz to 45Khz, two eight-inch, side woofers that utilize Barefoot’s Dual Force opposing sub technology, a four-inch aluminum cone midrange driver, and a one-inch, dual ring, radiating tweeter. Most of the differences have to do with aesthetics and more cost effective tool and clamp designs. Don’t get us wrong, the Footprint isn’t in the same league as the Micro Main in terms of components and image detail, but for the price, is gets “close enough” for many people, and worth serious consideration for midrange speakers in this price range. 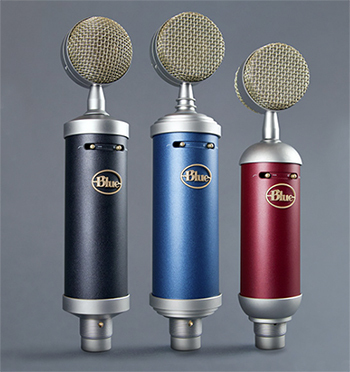 Blue Microphones introduced the new Essentials Series, comprised of three of their popular entry-level microphones, with updated features and specs. The three mics are: Baby Bottle SL (MSRP $399.99), which (according to Blue) delivers classic warmth and presence; Bluebird SL (MSRP $299.99), which offers modern, crystal-clear performance; and Spark (MSRP $199.99), which delivers detailed, transparent sound. Blue has refined the sonics, and all three mics now feature a 100Hz high-pass filter and -20dB pad. Each microphone in the Essentials Series comes in a wooden storage box and includes a custom pop filter. Blue was also showing the latest generation of its headphones. The Sadie ($399), replacing the outgoing Mo-Fi, features a multi-jointed headband, a built-in 250mW audiophile amp that delivers twelve hours of use from a three-hour charge, and a closed-back design. Frequency response is an impressive 20Hz-to-20kHz. Three modes include amp on, bass boost, and amp on (passive). 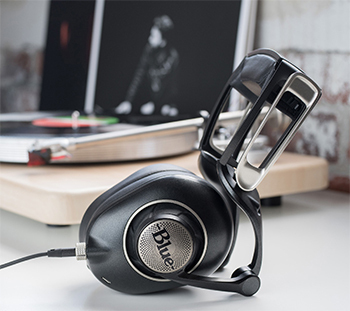 The Ella ($699) is a closed back, planar magnetic headphone, also featuring the same amp as the Sadie. They should be available in February. The ISOVOX provides an interesting alternative to those large, space consuming vocal booths. Not only is it small, compact, and attaches to a microphone stand, but it's fully collapsible for easy storage and transport. It may not be a good idea for a person with claustrophobia, but serves a great purpose for vocal practice (or late night recording) without interrupting your neighbors. On the loud NAMM Show floor, it provided a welcome relief from the noise. We always thought those computer keyboards with shortcut keys printed on them looked useful, but they were pricey, and also a bit cluttered looking for times when you weren’t working in your favorite DAW. Enter KB Covers, who make rubber keyboard shortcut covers that simply lay over your existing keyboard just like the funky colored skins that people love to stick on their laptop keyboards. We already put one of their Pro Tools keyboard covers to use on our Apple Pro Keyboard, and now we know a few things we didn’t even realize had keyboard equivalents! And, because these aren’t keyboard replacements, you can pick up multiple shortcut skins for each of your favorite apps. There are shortcut keyboard covers for most popular audio and video related applications, in sizes for a variety of keyboards ranging from the Apple Wireless to the Pro keyboard with numeric keypad, plus various Macbook laptops. 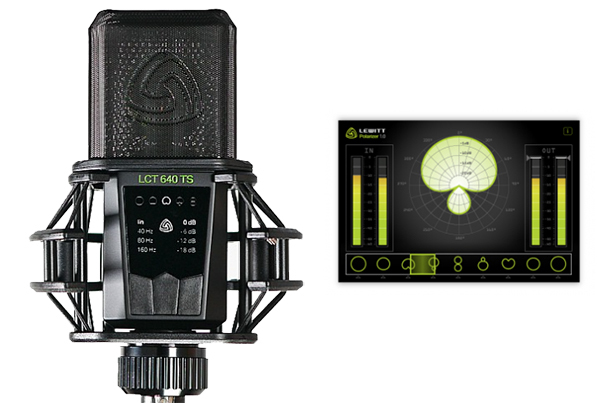 The Lewitt LCT 640 TS microphone is interesting and innovative: it has two diaphragms (and two XLR outputs) that enable the user to change polar patterns even after recording is completed. After recording to two tracks, the accompanying Polarizer plug-in for your DAW enables you to adjust the polar pattern and balance between the diaphragms after-the-fact. Awesome! This innovative solution enables stereo recording with one mic, which is a great time saver and solves a lot of phase issues out of the box (think of just one mic positioned above a drum kit, for example). Much time and effort can be avoided by not having to measure mic distances for phase issues. Additionally, the software enables the engineer to make in phase doubles of vocals and just about anything else from one take. We can’t wait to play with this mic in the studio, as it’s truly an exciting and intriguing audio product. 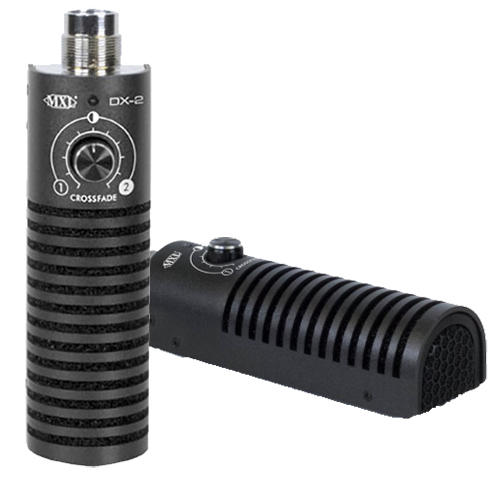 Not to be outdone by Lewitt, MXL introduced another innovative microphone, the dual capsule DX-2, designed for use with amplified instruments. 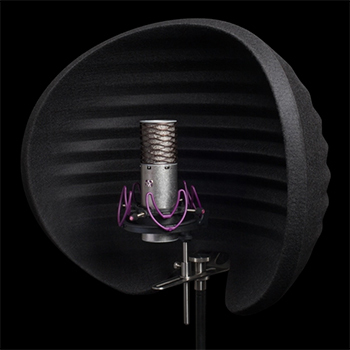 One side of the mic is flat, designed so that you can simply drape the microphone over the top of a guitar speaker cabinet. The speaker-facing capsule is a super cardioid, large capsule design, optimized for full-range sonic capture, while the capsule facing away from the cabinet is a small cardioid design focused on mid-range and high-end detail. A blend control on the face of the mic lets you dial in the captured tone to taste, with a single XLR output that records the blend of your choice. We’ve already got it in the studio for testing and can’t wait to explore this microphone innovation. Just when you thought the StudioLive series couldn’t get any better, PreSonus threw away the old book and wrote a new one. 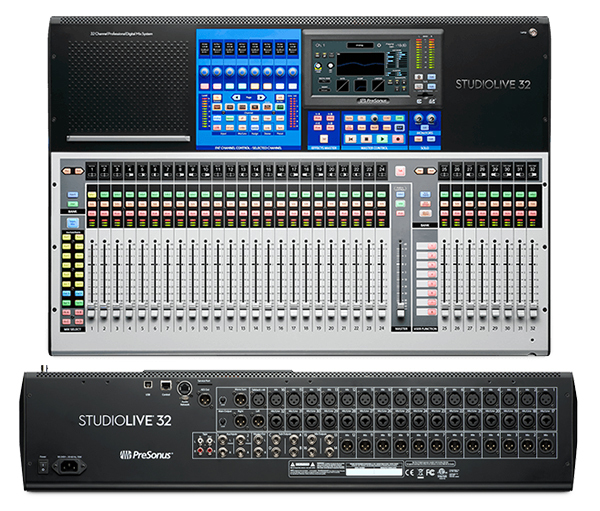 The third generation of the StudioLive series is presently shipping only in the 32-channel format, with the StudioLive 16 following shortly. Besides completely redesigned Fat Channel capabilities that now offer vintage-style EQ and compression options on each channel, the mixers have integrated multi-channel recording, straight to SD card! They now feature built-in AVB networking and digital scribble strips on every channel, and… motorized faders! We’re sad to see that Firewire connectivity gone, but the newly added USB 2.0 connectivity is more than up to the task for multi-track recording in a host DAW. 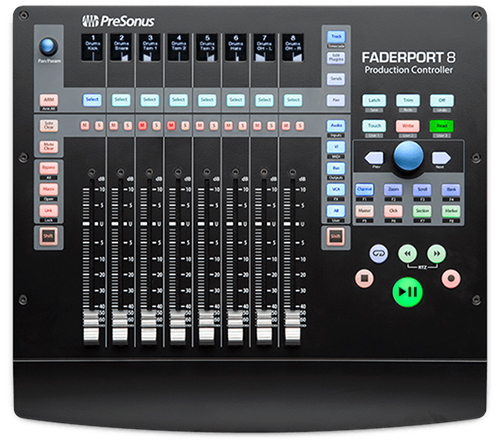 We also got to put our hands on the new FaderPort 8 studio control surface, which looks pretty sharp. It just arrived in our studio for review, so stay tuned for all the details. Slate Digital released the Virtual Recording Studio (VRS), the culmination of the Slate vision to model vintage gear never before affordable for most audio engineers and recording musicians. It includes the VRS-8 eight-channel preamp and A/D converter that enables users of Slate Virtual Microphone System (VMS) and the Slate Virtual Mix Rack (VMR) to have access to the greatest microphones, preamps, and effects ever created (virtually speaking, of course). When the interface is paired with the mix rack plug-ins, ML-1 LDC microphone, and the (also newly announced) ML-2 small diaphragm mic, this system packs one hell of wallop in terms of specs and versatility (the VRS-8 has 124 db of dynamic range and low latency of just 0.7ms). If you aren’t sticker shocked easily, the VRS-8, one ML-1, and five ML-2’s will retail for $3,000, which includes a one-year subscription to every plug in Slate has. In case it hasn’t sunk in yet, that means you could have access to most of the greatest microphone/preamp signal chains in history. If you already have Slate gear, the VMS and VRS-8 retail together for $2,000. In the middle of the pack (price-wise) is a five pack of ML-2s and the VRS-8 for $2,499. If this system delivers what it is supposed to, we expect that it will become a staple of project studios everywhere. 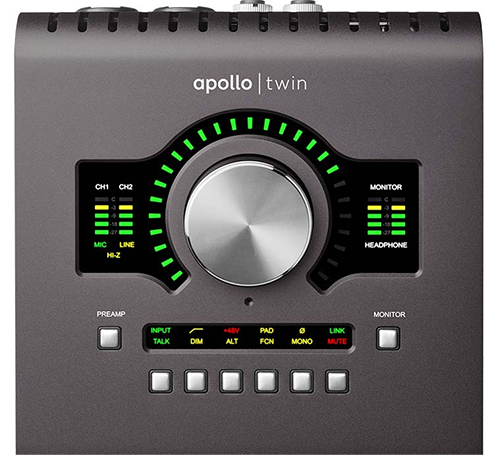 Who doesn’t want a more powerful version of the Apollo Twin desktop interface for mixing on the go from your laptop? The new Apollo Twin MkII has improved A/D/A converters that provide increased dynamic range, and it now offers quad-core processing for all of those fantastic, hardware-accelerated, UA plug-ins. It also features improved monitoring options and a built-in talkback mic. Our studios have at least a few pair of Yamaha headphones, and it’s nice to see (and hear) that Yamaha didn’t leave well-enough alone in their latest revisions. 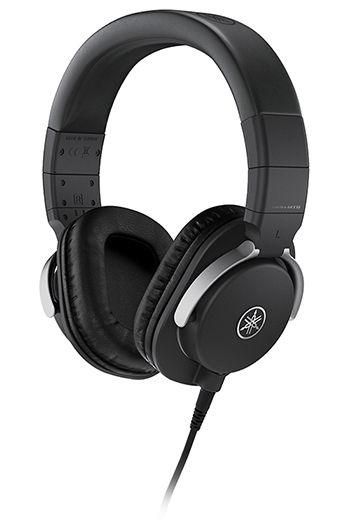 Yamaha introduced the HPH-MT5 ($169) and HPH-MT8 ($329) studio headphones. The closed-back design features synthetic leather and low-resistance cushions to absorb excess vibrations and reduce sound leakage. Both include a detachable, straight, 3-meter cord and coiled 1.5-meter cable. The cables feature a corrosion-resistant, gold-plated, stereo mini plug and quarter-inch stereo adapter.